Readers of An American Editor know by now my mantra: It has to be profitable! Profit is subject to myriad meanings; for me it means financial profit, whereas for other editors it has no financial meaning — rather, it must be soul satisfying; other editors have other meanings. The key is not how profit is defined but that profit represents what we, individually, seek when we take on an editorial project. When profit is defined in financial terms, it sets the parameters for how an editor approaches a project. With financial profit as the motivator, the editor seeks to do the very best job he can do but in the least amount of time. It was with that in mind that EditTools was created; it was with that in mind that Editor’s Toolkit Plus and PerfectIt and myriad other time-saving macros were created. One of the “headaches” of the type of editing work I generally do (medical textbooks) is the use of acronyms and abbreviations (hereafter combined into “acronyms”). For most of my clients, the general rule is that an acronym must be used not less than four times in a document (i.e., once when it is defined plus three additional instances); if it is used fewer times, then it should always be spelled out. However, if it is used enough times that it is kept, then it should be defined only at first use and not again. 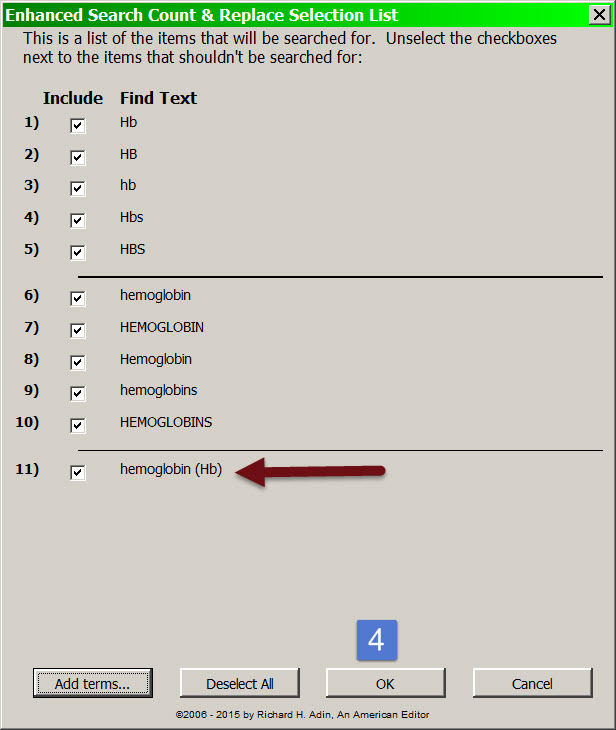 In this example, I searched for the abbreviation for hemoglobin: Hb (#1). 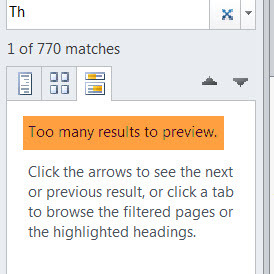 Word tells me that there are 11 “matches” (#2) and I can see the 11 matches in the pane (#3). If I click on one of the entries in the pane (yellow highlighted box), Word will take me to that item and highlight it (#4). This is fine for telling me how many times Hb appears in the document, but Word limits the value of this function in several ways. In other words, Find is not going to be helpful. Another problem with Word’s Find function is that it includes the whole document, you cannot tell it to search and report back only up to a particular point. Why is that a problem? In the example document I am using for this essay, there are 65 references, many of which include Hb, and none of which do I want in my count. I want in my count only the primary text. According to Word, the example document is 33 pages, but the main text fills only 21 of those pages. 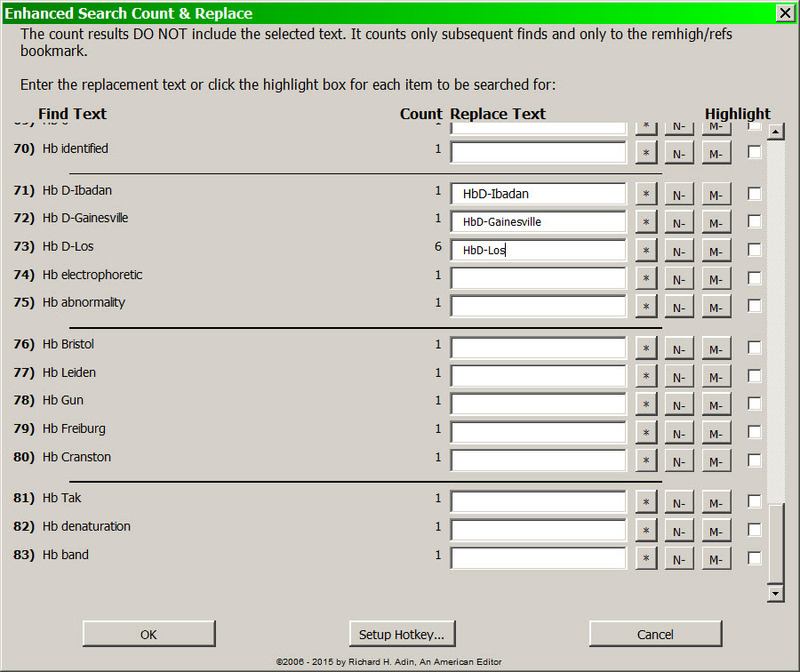 The result is that the count word gave me (11 instances of Hb; see #2 in the image “Word 2010 Navigation pane: Find” above) is not accurate for determining whether Hb should be retained as an acronym. Word’s Find also has another failing, which for me is a big failing: In a long document with lots of acronyms, Word’s Find gives me no way to easily determine whether an acronym has been previously defined. So if I encounter an acronym on page 5, where it is first defined, and then again on page 12, where it is defined again, absent good memory or conducting another Find search, I am unlikely to recall/know that the acronym has already been defined. There are things I could do — for example, I could go to each instance of Hb via the Navigation pane and highlight each and scan the nearby text to delete redefinitions — but that takes time, especially if there are a lot of instances, and thus eats into profit. That would be especially true with those chapters I have to edit where the text portion alone runs more than 100 pages (and sometimes 200 or more pages). 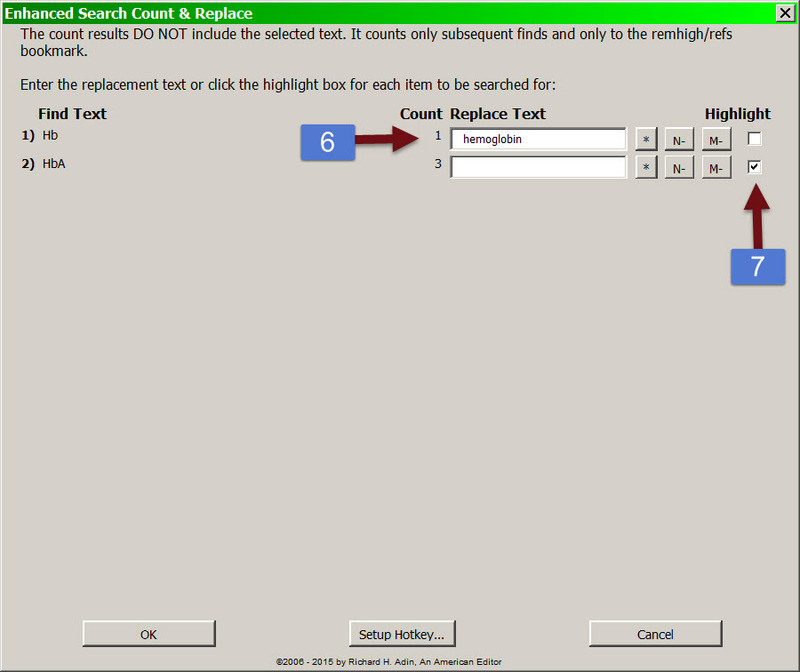 For me the best way to deal with the question of acronyms is with EditTools’ ESCR (Enhanced Search Count, & Replace) macro. The macro is found on EditTools’ Highlight menu (red arrow in image below). With the phrase selected (and copied), I click ESCR. The macro produces a list of what it will search for, #1 in the below image. If you look at the list, you will see that the macro automatically separated the terms and created variations for singular and plural. Again, it is a dumb macro so it will do silly things, such as item 5, HBS. You can either let it go, or you can uncheck (#2) the item(s) you don’t want included in the search. I have found that for the most part it is as easy to leave it as to decheck it. I have decided that I want the whole search phrase searched for (I wouldn’t normally do this; I am doing just for demonstration here), so I pasted the selected phrase into the first empty field (#1 in image below). If I wanted to add a symbol, for example a Greek beta, I could click the * (#2) to bring up Word’s Symbol dialog; for an N or M dash, I could click the N- or M- button (#2). 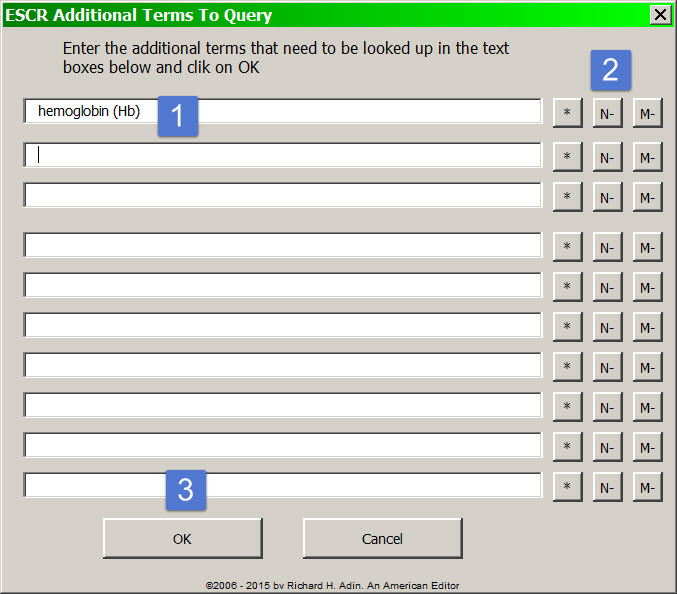 Once all the terms I want the macro to find are added here, I click OK (#3), which will take me back to the primary Find screen where I can see that the macro has added my search term as item 11 (arrow). If I am done, I can click OK (#4) to run the macro. When the macro runs, it goes through the entire list of items to see what it can find. [IMPORTANT: The macro searches from the character immediately following the selection you made to wherever the end bookmark (remhigh) is located. The end bookmark is usually inserted automatically based on other choices you have made in EditTools, but it can also be added manually by you. If it needs to be added by you, when you run the macro, a message will popup telling you that the remhigh bookmark is missing and needs to be added. Although you can place the bookmark anywhere in your document, it is recommended that you place it at the end of the primary text and before any references, tables, or figure legends/figures.] 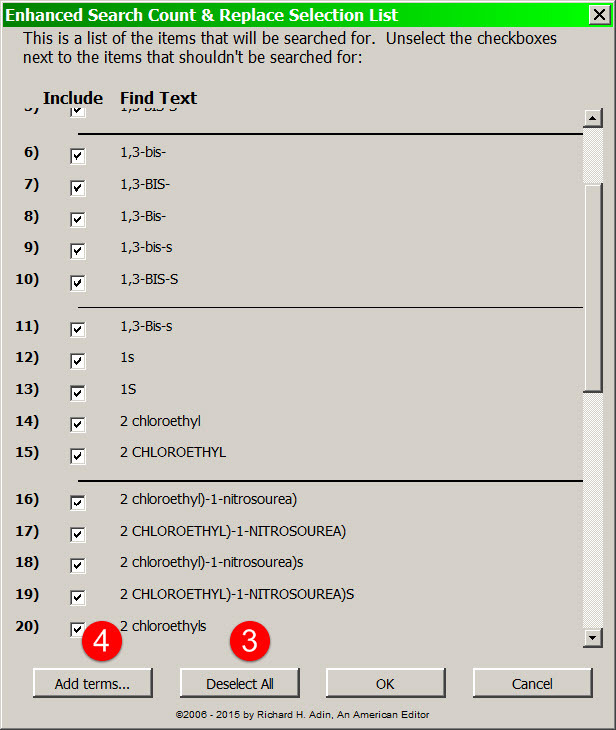 The macro searches down from the point of the selection to the end of the main text of the document. In our example, it only found two variations: Hb and HbA (#2). 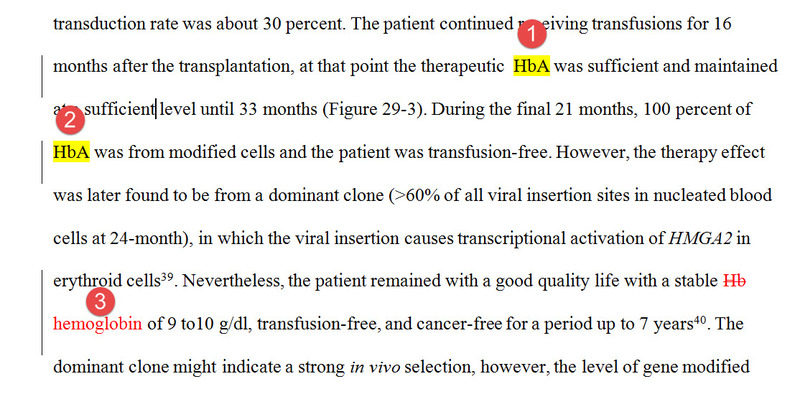 Based on this report, it is safe to conclude, for example, that hemoglobin is not used in the text after this point. Also, it is clear that Hb, regardless of how it is used, appears only four additional times in the text. You now have two options. 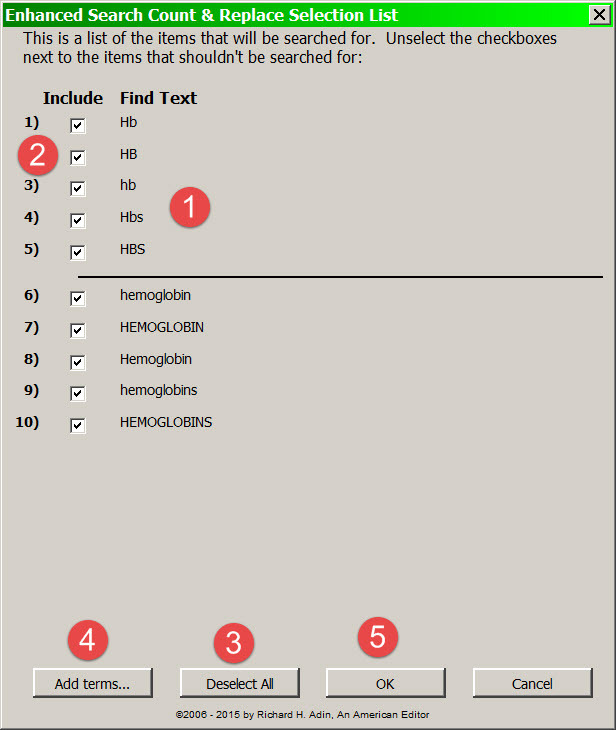 First, if you do not want Hb to be used as a substitute for hemoglobin, you can enter hemoglobin in the empty field (#3). (Similarly, if the book style is for Hgb to be used instead of Hb, you can instruct ESCR to change each instance of Hb to Hgb.) This will instruct the macro to replace Hb with hemoglobin. Second, if using Hb and/or HbA is OK, you can check the highlight box (#4) so that the macro will highlight these terms throughout the manuscript. The highlight will indicate to you that (a) you have already done a search for the term and found that it appears enough times in the manuscript to be retained, (b) that the term has been previously defined so if you should see it spelled out again, you know to replace the spelled out version, and (c) that the term is correct (even if Word insists it is misspelled). The image below shows that I have decide to change the one instance of Hb to hemoglobin (#6) and that I want HbA highlighted (#7). 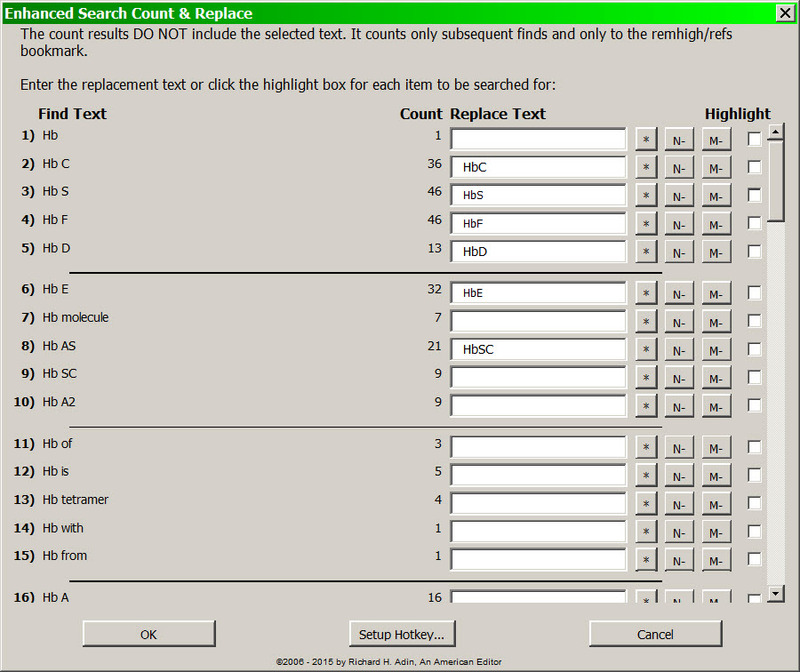 Clicking OK (#5 in ESCR’s report above) causes the macro to run and make the changes. As the following image shows, ESCR made the changes as instructed — and does so with tracking on (even if you have turned tracking off). HbA is now highlighted (#1 and #2) and Hb has been changed to hemoglobin (#3). The ESCR macro is very useful in these circumstances. The two images below are from a document I edited recently. They are the first and last screen of the results of a search for Hb in a nearly 200-page chapter. The macro found 83 variations and you can see that some changes would be required. The advantage is that I can address all of these at one time, enabling me to make them uniform in presentation, and any changes are with tracking on so I can undo any erroneous changes. 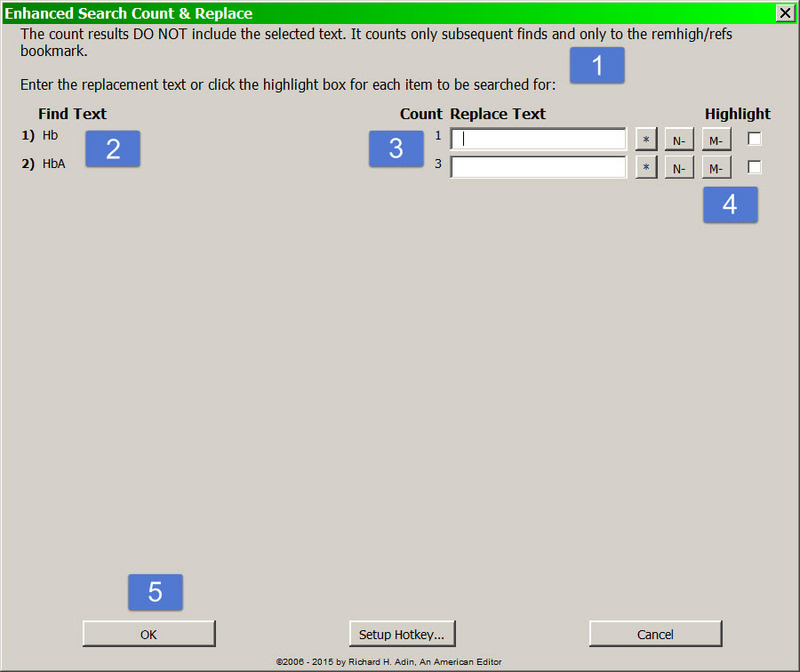 Word’s Find feature cannot do this as quickly and easily as ESCR (in fact, Word’s Find gave the “too many” message in this instance). Working smarter is the a key to editing profitably. Making use of the right tool at the right time is one hallmark of a professional editor. Importantly, doing those things that help improve accuracy and consistency makes clients happy clients. EditTools is an important tool in the professional editor’s armory.